← More Jantastic and an even better long run! Thanks! I haven’t really trained for the half, but am using it as part of my Marathon prep to get some race day practice done! That’s a good idea. Weather forecast ok so should be a good day! Forecast is currently cold but dry, I can cope with that! Praying for no rain. Nice collection! Those adidas look nice. All of them look nice actually. Don’t worry, you are not alone. I have 7 pairs of running shoes, plus another 2 pairs of Asics that I just don’t wear anymore because they feel too heavy. I know what you mean! I had two other pairs of Nikes that found their way to a good home as they felt like my feet were in cement. I picked up a pair of Hokas recently too. They’ve been fantastic for winter running – excellent grip on the icy roads, and they plow right through 2-3 inches of snow. I’m going to put them to their first trail test next weekend (DWD Green Swamp 50K), but as I developed a blister wearing them on a recent 16-mile run I may not use them for the entire race. The Rapa Nui’s are great, if a little tight around the forefoot. Would also love a little more traction for the UK winter of mud and rain. You have totally dwarfed my one-shoe horse post! Great blog, righteous host of shoedom! My goodness. I am so jealous of how many pairs you have!! Hah, I’ll pass for now! Not sure which word sells them the best. Smelly, old or reject! I’m always interested in seeing other running shoe obsessives collections, I tend to double on the road so some of my numbers are silly. Had a sort out resently, throwing away 4 old pairs and I am now down to 18. I like Adidas and think the Adizero Adios are great, I have three pairs, I also have a pair of the Boost Adios, Adizero Ace and Tempo, 2 x Marathon 10 and 2 x Oregon 11. 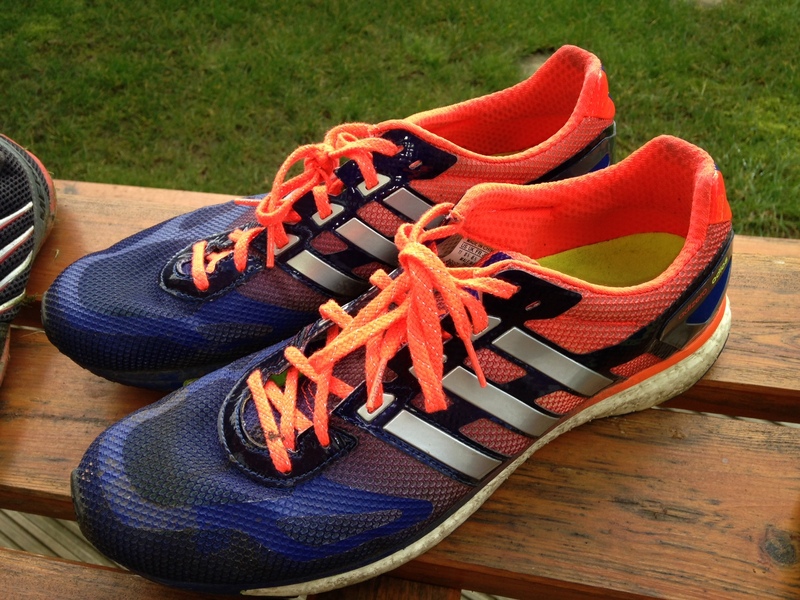 2 pairs of Adidas trail shoes, Kanadia and Adizero XT and a pair of Adidas XC spikes. No I don’t work for Adidas, nor am I sponsored by them (I wish). I have a couple of pairs of fell shoes, Inov8 X-Talon 190 and 212, plus 2 more pairs of XC spikes, Nike and New Balance. Finally, whilst I am not barefoot / minimalist type I have some Vibram Bikila that I got given and have done some miles in. You may have a problem, but others have it worse. I have banned myself from buying anything else this year. Thanks for the comment, I’m jealous of your shoe collection! I’m a big fan of my Adios Boost, although I don’t think I’m fast enough to really get all the benefits of them yet! One thing I did notice was I had to size up massively due to how narrow they are, they’re a 10.5 and in Inov-8’s I’m a comfortable 8.5. Is that common with the Adidas range in general? I haven’t banned myself from buying anything else, but my wife definitely has. I’m going to need to run a few of these pairs into the ground before I get any more! Great collection. 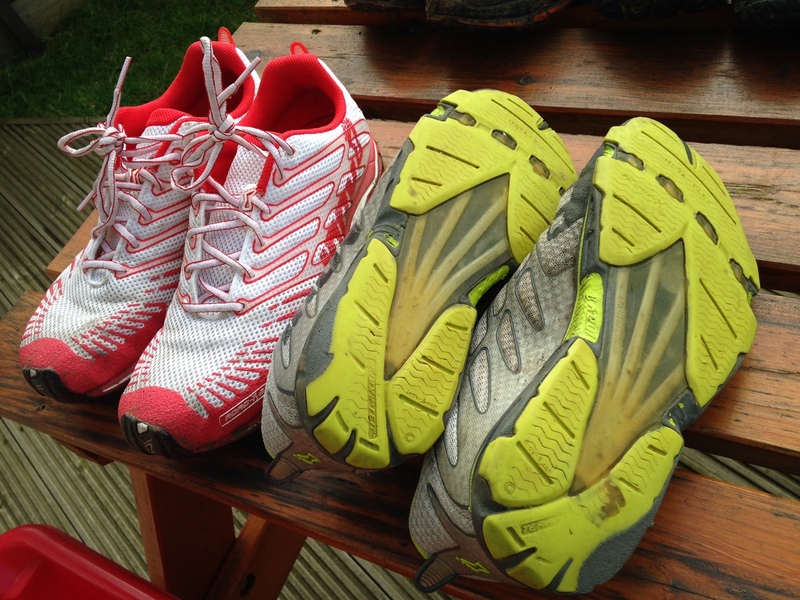 I’m rotating between Skechers Go Run Ride and Go Bionic shoes and really impressed with them. 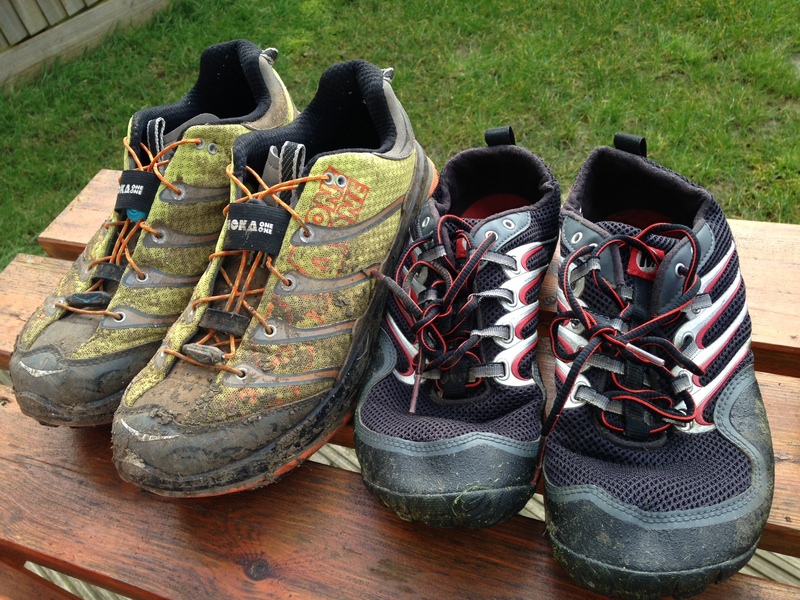 I’ve been thinking about trying out Inov-8’s and wondered how you’ve found them in comparison to the Skechers? Thanks for getting back to me, always good to know how they compare to shoes you already own and perfect excuse to buying more running shoes!